The National Association of Manufacturers (NAM) New Market Export Initiative is launched! Janice A. Corbett is a Commercial Officer with the Office of Strategic Partnerships. She is currently serving as the U.S. Foreign Commercial Service Liaison to NAM. 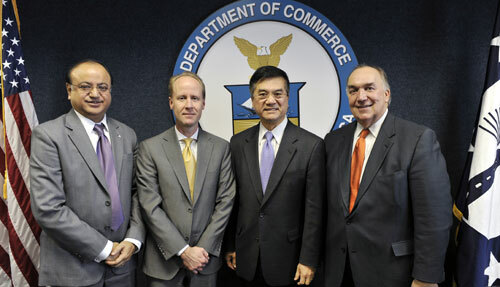 Governor Engler, President of the National Association of Manufacturers (The NAM); Russ Fleming, FedEx Vice President of International Marketing; and, Assistant Secretary/Director General Suresh Kumar. The NAM-NMEI will encourage NAM’s manufacturing Members to expand their exports to new international markets in support of the National Export Initiative. The first phase of this program will initially target 500 NAM small and medium sized manufactures. In the subsequent phases, the NAM plans to expand this program to all of their members. Approximately 50 people attended the launch today, including reporters from Bloomberg, Reuters, and Washington Trade Daily. I look forward to personally working with NAM’s Members that participate in the NMEI to helping them find new export opportunities abroad. As we know, more exports equals more jobs, and we are all excited to see great success working with the NAM!